This entry was posted on July 14, 2013 by Andie Pantazi. Graduation hoods are your symbol of reward for the dedication and patience in every struggle that you have encountered throughout your student life. You have been dutiful to your respective field at your school. That is why when it comes to commencement day, you have to do the utmost thing you can do- and to initiate- make sure to wear your academic regalia properly. Try to picture out yourself along with your co-graduates having a hard time fixing your graduation clothing- that surely would be embarrassing. Knowing the fact that graduation hoodscatch the crowd's attention, you have to make the best look of it through your attachments. When it comes to graduation hood attachment, the hood is the most complicated. There are lots of components where each has integral meaning to represent. The velvet colors of the hood that representthe degree that you have earned should be precisely displayed in the front and at the back of the hood. Actually, you don't wear the graduation hood unless you receive your degree. The academic authority will be the one to put your hood in the graduation ceremony. On the other hand, universities are not the same in terms to rules. Some might instruct their students to put on the hood all throughout the ceremonial period, sometimes due to size and time constraints. 1st step –have on the graduation gown before you wear the graduation hood. 2nd step –place the hood over your head. Make sure that the velvet placed side up along the small pointed V-shaped edge in the front part of the neckline and the U-shaped long drape at the rear. 3rd step - flatten the hood's front part into itsright position so it will restexactly below your chin and aboveyour shoulders. 4th step –make sure that the loop at the front of your clothing is attached accurately to keep the graduation hood in its right position. You can use the safety pin if there's no loop. 5th step – call someone's help to carry out the attachment at the rear part of the hood. 6th step – rotate the lining at the rear of the hood by using the fingers. This can be done by starting below your shoulders and then rotate its clothback to frontin order to expose that part of the hoods color. 7th step –flattened the bottom of the hood at the back part so that it will position appropriately. 8th step - secure the back cord using two buttons for the lining of the hood to keep the back part in place. Beforehand, ensure that you perfectly receive the approved academic color, shape and style of your hood by the institution where you will be graduating prior to the commencement ceremony.Explore GradShop for more details about graduation. 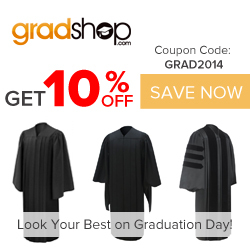 You will definitely look excellent on this vast event once your graduation hood and gown achieved proper usage.